Casilando Casino is an English, German, Finnish, Norwegian and Swedish language casino. 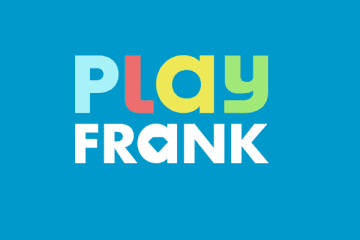 This domain primarily caters to players in those Northern European countries. And has been doing so since it debuted in 2017. Imperium Network Solution Ltd own the casino, which forms a part of the White Hat Gaming network. They also own 21Casino, Slot Planet and Fruity Casa. Read our independent Casilando review. Decide to play at this UK, Maltese and Curacao licensed casino, and you can enjoy both instant play and mobile gaming platforms. Moreover, the casino also offers a tasty welcome bonus to anybody who chooses to give them a run for their money. Join Casilando as a new player today! You can snap up a 100% match which is worth up to £300. And 90 bonus spins when you make your first deposit. Claim welcome bonus! Why Play at Casilando Online? Casilando Casino primarily offers online slots to its players. But there are other games you may wish to have a look at when playing there, too. These include top games, new games, slots, jackpots, live casino games, blackjack, roulette, table games, poker games and other titles. Some of those “other” games include the likes of keno, bingo and scratch card games as well as other instant win casino games. The casino features titles from plenty of leading developers, too. Expect to find games from 1×2 Gaming, 2By2 Gaming, Amaya Gaming, Blueprint Gaming, ELK Studios, Evolution Gaming, Ezugi, Games Warehouse, Genesis Gaming, Leander Games, Lightning Box Games, Microgaming, Net Entertainment, NYX Interactive, Quickspin and Thunderkick, amongst others. Live casino games are all the rage right now, and Casilando has more than a few to share with you. They are dishing out Evolution Gaming, and NetEnt live casino games, some of which include Dream Catcher and Football Studio, as well as roulette, blackjack, hold’em poker, and dragon tiger variants. As mentioned, slots easily form the lion’s share of the games that you can play at Casilando. The types of games you have open to you include the likes of Rich Wilde and the Book of Dead, Butterfly Staxx, White Rabbit Megaways, Starburst, the rock and roll-themed Guns ‘N’ Roses slot, Top Cat, Fruit Blox, the newly released Reel Talent and Vegas Diamonds slots, and movie-themed games such as The Goonies. Players may also wish to look out for legendary games, such as Dr Magoo’s Adventure, Energoonz, Immortal Romance, Thunderstruck, Gonzo’s Quest and more when playing at the online casino site. While those slots are tempting, it is the progressive jackpot slots which will really appeal to players. 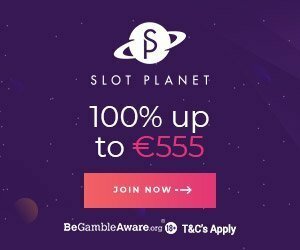 The slots can offer life-changing sums of cash and include Mega Moolah, Divine Fortune, Mega Fortune, Cosmic Fortune, Arabian Nights, Hall of Gods, Apollo: God of the Sun, Major Millions and many more. 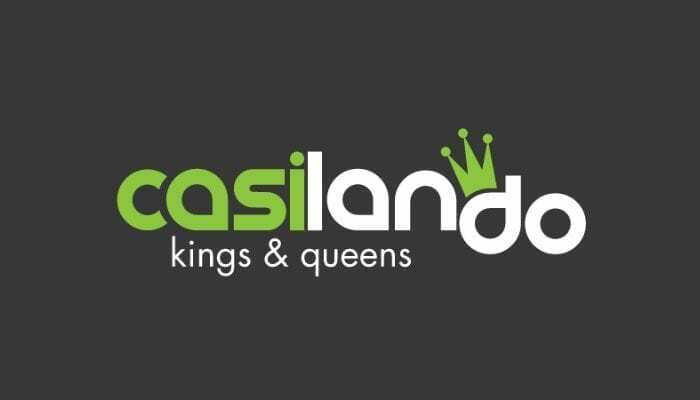 Casilando is a mobile-friendly online gaming portal, although it doesn’t necessarily favour players on mobile devices. Instead, the casino is just as at home offering instant play gaming to players on laptops and desktop computers than their smartphones and tablets. Speaking of smartphones and tablets, Casilando can offer players access to both iOS and Android-friendly gameplay. This is because players do not need to download an app to play. Instead, they merely need to open up Casilando Casino in the web browser on their devices. They are good to go. Casilando Casino offers support around the clock, 7 days a week. They provide support by e-mail and live chat. Both options are free, and between the two you should rapidly be able to get the kind of help and assistance that you require. However, for more general troubleshooting issues, there is an FAQ guide available which might just sort you out with answers to any more fundamental, mundane questions you may have. Casilando is a renowned online casino. It features licensed out of three of the most respectable licensing jurisdictions on the internet. In Curacao, Malta and the United Kingdom. They wouldn’t be able to hold all three of them if they were adhering to the rules and fair play. This online casino features SSL (Secure Socket Layer) encryption, is regularly audited by independent auditors and verified for secure and safe gaming. Game RTPs are also published freely online, so players can always check to make sure that everything is above board before they play at games at Casilando. More than a few deposit methods are known to be accepted at the online casino. For starters, they carry VISA, MasterCard, Trustly, Giropay, Sofort, Paysafecard, Skrill, Neteller, and Bank Wire options. However, more local options may also be available, depending on the country you reside in. Deposits land instantly in your account and are free of charge. By contrast, the list of withdrawal methods is not as extensive as those available for deposits. Players can still withdraw free of charge, although transaction times are certainly not instantaneous. Instead, players are looking at waiting times of up to 24 hours for e-wallets, and between 3 and 5 days for credit/debit card and bank transfer withdrawals. This is, of course, after a pending period which could last anything up to a day. Accepted currencies at this casino include GBP, EUR, NOK and SEK. 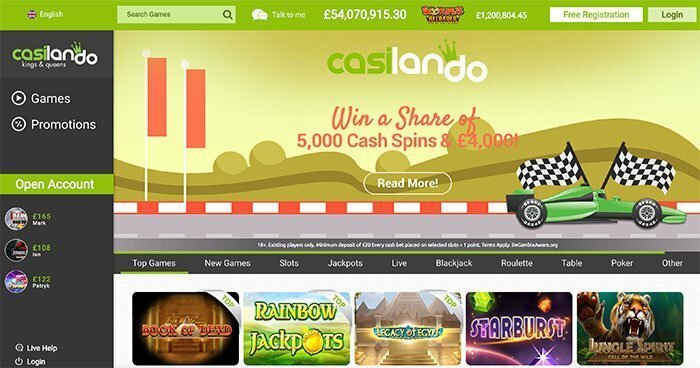 Becoming a new player at Casilando can see you able to snap up a 100% match deposit bonus, and one which is valid up to £300 in all. On top of that, you’ll also get to prosper from 90 bonus spins on top slots at the site. These slots include Starburst, Joker Pro, Pyramid: Quest for Immortality, Steam Tower, and Fruit Shop. Also check other casino bonuses. As well as the main welcome bonus offer, Casilando also has a few other deals you may wish to check out. For instance, players can snap up holidays in the sun with the casino’s monthly prize draw competitions. 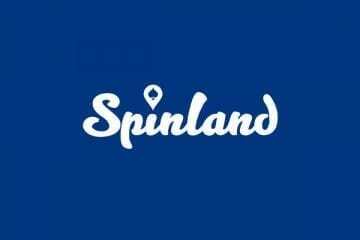 There are regular bonus spin offers up for grabs, and Casilando’s loyalty bonus program can always see you in green. It can provide you with points for every wager you make. Which over time can be exchanged for real cash. Which you can then use to play more games for real money at the casino.